This image Bald Eagle image was created with the Canon 70-200mm f/2.8L IS II lens), the 1.4X III TC (handheld at 280mm) with the Canon EOS-1D Mark IV). ISO 1600. Evaluative metering +3 stops off the sky: 1/1250 sec. at f/4. Central Sensor/Rear Focus/AI Servo AF active at the moment of exposure. I arrived safely in Homer, AK at 10:30pm on Monday evening pat after an uneventful but long (23 hours door to door) trip from Orlando to the Land’s End Resort. The first morning of the IPT dawned to pouring rain and high winds so the group holed up and enjoyed two long, educational slide programs by Robert O’Toole and yours truly. The rain and wind eventually let up a bit so we boarded our two boats and headed across the bay to three some fish. Conditions were less than ideal :). Exposure for me was simple and I shared the following with the group: work in Manual mode. Dial in the widest aperture. Set ISO 1600–I told you it was dreary. Point your lens at the white sky and adjust the shutter speed until the analog scale in the viewfinder shows exactly +3 stops. 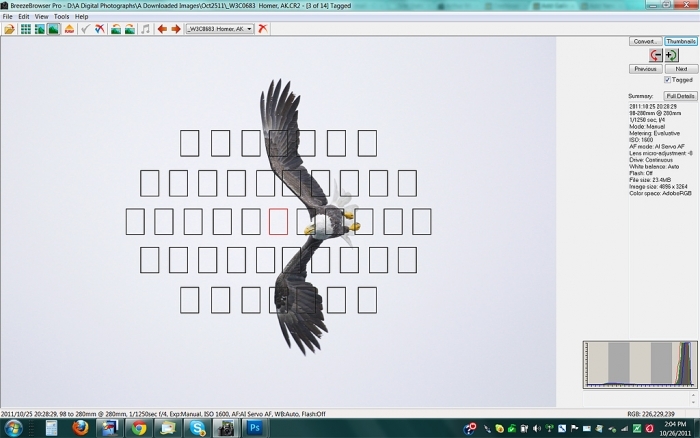 Now photograph an eagle and check for blinkies on the bird. (A few blinkies on the sky are fine.) Keep firing until the light changes. By simply pointing your lens at the sky you will see when you lose light. At that point you can choose to set a slower shutter speed, set a higher ISO, or switch tracks all together and begin creating pleasing blurs. Here is a screen capture of the BreezeBrowser main view for this image. Note the perfect histogram. By exposing to the right I ensure getting maximum detail in the blacks while reducing noise as well. 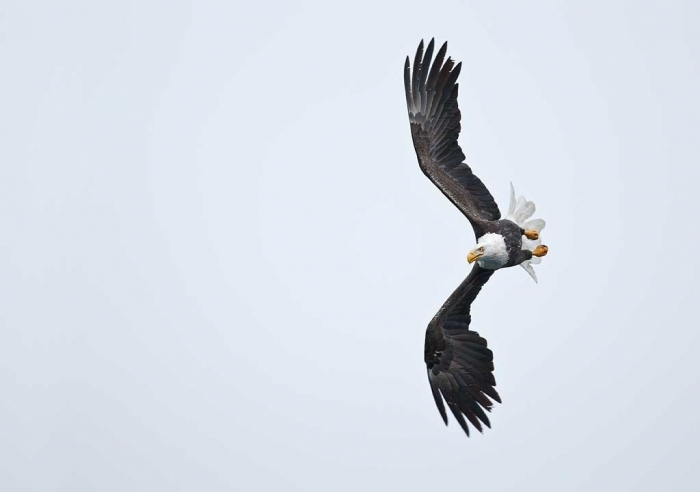 Note also that the bird was too centered in the original capture. I moved the bird to our right in the frame quickly and easily using one of the great tutorials in Robert O’Toole’s APTATS II. Maybe a slight bump to WB will improve the dreary skies without negatively impacting the subject?? Or, use Viveza with a Control Point on the sky only? Artie: I can’t thank you enough for your continued devotion to helping us become better photographers. I learned the hard way to overexpose in such conditions, but not as systematically as you describe. I’ll look forward to trying it. What do you do about the sky, though? Sometimes, to get a good exposure for the bird, I turn a beautiful blue sky into a dull gray sky. Thanks Artie.. useful for my trip south to shoot the eagles.. Not sure if makes a dreary sky any more interesting, but it certainly makes setting the exposure easier. Thank you for an interesting approach to a uninteresting sky!! I saw you used 1/1250 ..and all was ok ..but could be better more speed to avoid problems ? Another question about the setting exposition : you set the exposition on the sky in manual and you put the scale in the right point (medium no under no upper) and then used this setting for eagle or put in advance +3 stop ? In this case why you decided +3 ?